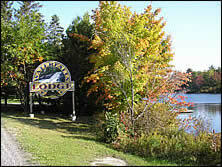 Our drive-to Lodge is located in Northern Ontario in Canada. 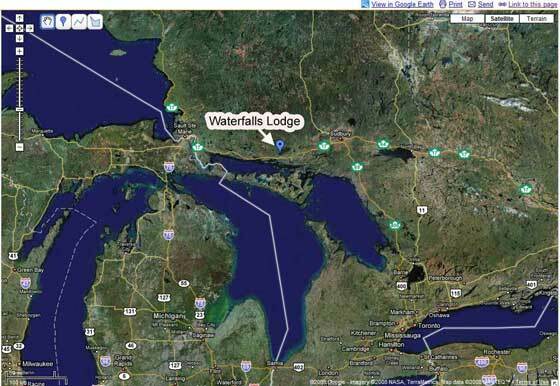 We are near Spanish, Ontario, about 125 miles east of Sault Saint Marie. We are a 2 ½ hour drive East of the International Bridge at Sault Ste. Marie, which is at the tip of Michigan's upper peninsula. Take Interstate 75 North to Sault Ste. Marie. Cross the International Bridge into Canada. Take Trans Canada Highway 17, 2 ½ hours (125 miles) East to Spanish. 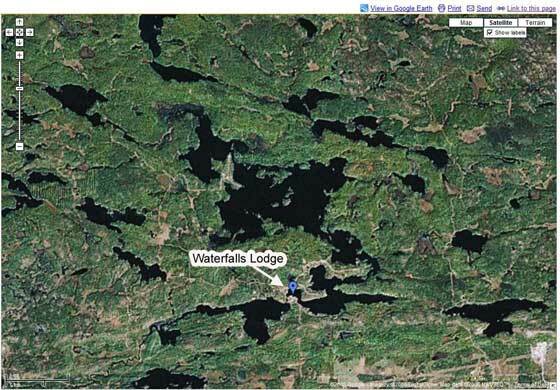 Stay on Highway 17, 3 miles East of Spanish take Waterfalls Road North 2 ½ miles to our beautiful Waterfalls and chain of lakes. We are 5 hours from Toronto. Guests arriving via Interstate 90 at Buffalo or Niagara Falls, Take Q.E. 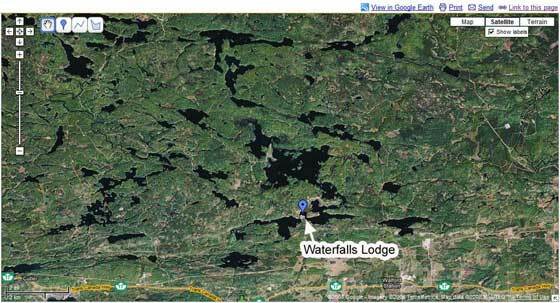 Way to 407 West (toll highway), to 400 North (which later becomes 69/400 North), to Highway 17 West and travel 60 miles from Sudbury (through Massey) to Waterfalls Road, then turn right to the Lodge. We also have information on an alternate ferry route. Whichever route you use, you'll be royally welcomed. 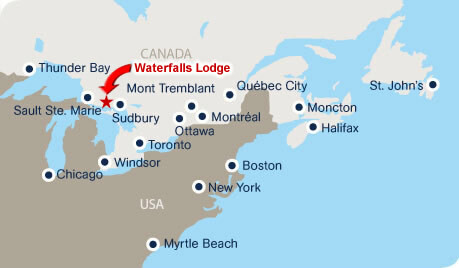 We at Waterfalls Lodge sincerely look forward to serving you as your hosts. Porter Air flies from several major US and Canadian cities to Sudbury, Ontario (a 1 ½ hour drive away) or to Sault Ste. Marie, Ontario (a 2 ½ hour drive away). Car rentals are available at the airports, or shuttle service may be arranged.